Form the cream cheese into the shape of a pineapple. Just pat down all around the edges and it will naturally go into the oval shape you want. If using scallion tops, cut into ribbons to resemble the “leaves” of a pineapple. Or just cut chives and tuck under the top of your oval. The tops of leeks look most authentic and you can cut the tops diagonally to resemble real pineapple leaves. Lift up the top of the “pineapple” and tuck underneath just about an inch to secure. This will be the pineapple top. 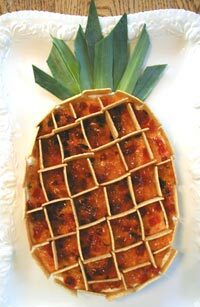 Spread the Pineapple Pepper Jelly evenly over the cream cheese. Arrange the wheat thins all around the edge of the pineapple and criss-cross more wheat thins diagonally as shown. Press the wheat thins down into the cream cheese so they stay upright.